In these weeks between semesters, I have been preparing for an 8-week Special Topics course that I am about to co-teach. The topic my colleague and I have chosen is “Musical Outliers,” and our focus will be on three composers who are thought to have lived outside of their times in one way or another: Carlo Gesualdo, Sergei Rachmaninoff, and John Cage. Gesualdo’s late madrigals betray a chromaticism that, while not entirely unheard of in the music of his contemporaries, reaches a level of saturation that distinguishes him. (This is not to mention his being set apart by the grisly details of the premeditated murder of his unfaithful wife.) Gesualdo is often seen, whether entirely accurately or not, as being a kind of progenitor of ultra-chromaticism, beginning a lineage that leads to the chromaticism of Wagner and ultimately the atonality of the 20th century. Many 20th and 21st century composers have been drawn to Gesualdo and have written works based on him or his life, one such work being the very recent premiere of Marc-André Dalbavie’s opera, Gesualdo. John Cage was in many ways very much of his time. Yet his status as maverick and challenger of all pre-existing notions of what music is, or of what it should be, qualifies him as a candidate for the course. Furthermore, the plethora of available Cagean scholarship to choose from provides plenty of potential in facilitating fruitful and wide-ranging class discussions. Rachmaninoff’s felt alienation had as much to do with living in an age of musical modernism, the landscape of which was dominated by Schoenberg and his disciples, as it does with Rachmaninoff’s then recent immigration to America following the Russian Revolution of 1917. A second reason for the scholarly neglect of Rachmaninoff’s music is his supposed adoption of traditional, tonal harmonic language—one considered to be worn and out-dated during his time. It is much more glamorous for theorists to wrestle with the new, with those composers who push the musical envelope at any given time. As a result, composers such as Rachmaninoff are ignored. “As a pianist Rachmaninoff was one of the finest artists of all time; as a composer he can hardly be said to have belonged to his time at all, and he represented his country only in the sense that accomplished but conventional composers like Glazunov or Arensky did. He had neither the national characteristics of the Balakirev school nor the individuality of Taneiev or Medtner. Technically he was highly monotonous in texture, which consists in essence mainly of artificial and gushing tunes accompanied by a variety of figures derived from arpeggios. A third reason for Rachmaninoff’s neglect is related to the second. 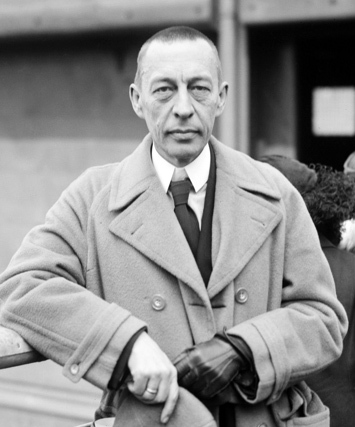 To many, it seems that above the very traditional harmonic framework in Rachmaninoff’s music is spread a barrage of superfluous notes—a veneer of endless filigree intended only to demonstrate the technical prowess of the performer. “One can even get a certain perverse pleasure out of hating the work of a particular composer. I, for instance, happen to be rubbed the wrong way by one of today’s composer-idols, Serge Rachmaninoff. The prospect of having to sit through one of his extended symphonies or piano concertos tends, quite frankly, to depress me. All those notes, think I, and to what end? To me Rachmaninoff’s characteristic tone is one of self-pity and self-indulgence tinged with a definite melancholia. As a fellow human being I can sympathize with an artist whose distempers produced such music, but as a listener my stomach won’t take it. I grant you his technical adroitness, but even here the technique adopted by the composer was old-fashioned in his own day. I also grant his ability to write long and singing melodic lines, but when these are embroidered with figuration, the musical substance is watered down, emptied of significance. But if any music can be used to demonstrate the deficiency in unidirectional top-down approaches, it is Rachmaninoff’s. For it is the surface textures, the veneer above the structural framework, that gives Rachmaninoff’s music its character, its expressivity, and its deep power. And once we look begin looking at the surface, we see a composer who is far less regressive and a music that is far less traditional than is usually supposed. To demonstrate what is meant by this, consider the suspension figure. A simple suspension is one of the most expressive basic units of music: a sharp strong-beat dissonance which resolves downward on a metrically weaker beat. If reducing a texture featuring suspensions removes all “NCTs,” then all the expressive power the suspensions add is also lost. (Textural reduction is an essential part of analysis, but it is important to remember the reasons for reducing and to remember what is lost by doing so.) One of the dominant characteristics of Rachmaninoff’s textures is his shifting of resolutions through appoggiaturas, suspensions and anticipations (not to mention the prevention of resolutions altogether). Many such expressive surface features must not be ignored in an investigation of Rachmaninoff’s music if the investigator hopes to get a glimpse of the expressive power of his music. The first three are more readily apparent aurally and examples have been linked. The last five are more intriguing and warrant further investigation which will be taken in subsequent posts. This entry was posted in Uncategorized and tagged analysis, rachmaninoff, style. Bookmark the permalink. Getting chromatic notes is a big important and much interesting things to do music, that’s I feel. thanks for shear it.Thanks for such a great blog.I am thoroughly surprised after reading your article. In fact I have experienced a condition something like this but I am just not able to tell you how better I feel after reading this. Outstanding post! Looking forward to your future treatment of his work.